Crimer Show on Twitter: Why you should follow this delightfully bizarre parody of crime shows. As entertaining as they may be, police procedurals tend to blur together after a while. Certain tropes recur, like the fact that the most recognizable guest star inevitably turns out to be the killer. And each show has tics that recur in episode after episode, like David Caruso dramatically donning his sunglasses on CSI: Miami. It doesn’t help that so many of them come in multiple versions. The new parody twitter account @CrimerShow takes this inanity to new extremes, mocking the ridiculousness and repetitiveness of the NCISs and Law and Orders of the world. Where most parody accounts focus on a single individual, @CrimerShow takes full advantage of its broad topic to lovingly send up the silliest crime drama clichés (including the aforementioned sunglasses). 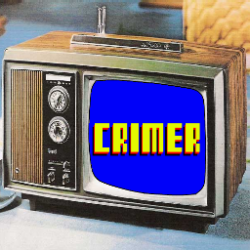 To get you all caught up, Crimer Show documents the ongoing struggle between Crimer, a grammatically challenged criminal, and Detetcive (sic), a linguistically and investigatively inept detective. Their adventures play out in a silly, lolcat-like gibberish that underscores the painfully obvious dialogue of most crime shows. Like its television counterparts, Crimer Show is always trying to come up with more shocking crimes. However, unlike TV crime shows, it doesn’t owe even a nominal allegiance to reality. As such, Crimer has engaged in activities such as stealing a police helicopter and swapping all the zoo animals with paintings of animals. DETETCIVE: Looke Hes is Inthat helpycoptor ! Stope him! POLISEMANS: But thats is Polise helpycoptor ! Hoew didhe get? DETETCIVE: CrimERRRR ! DETETCIVE: (in the zoo) Whats! ASSTANT: Whats! POLISE: Thise is toemush . DETETCIVE: Hes is tooke allthe Animoles an swoped thems with Arte? The man behind this non-stop parade of weirdness is Astonishing Sod, an Irish comedy writer who previously created @frients_show (a parody of—you guessed it—Friends). If that earlier project is any indication, Crimer Show will only get stranger from here.